We love all members of The Escapist community, but we love these four guys just a little bit extra. One of the things we here at The Escapist really enjoy about going to shows and conventions is the opportunity to meet fans of the site. Communicating via email, PM, or IRC just isn't the same as actually getting to talk with someone face to face. I spent a fair amount of my time at New York Comic Con just talking games with Escapists who stopped by our booth, and I genuinely enjoyed every minute of it. 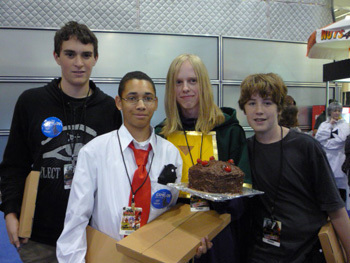 But none of the folks I talked to were nearly as awesome as these guys, because these guys brought us cake. Not just any cake, either. Portal cake. I have absolutely no idea how Jagade Eaddy-Boykin (Xspyhunter24), Luke Barry (dc.Justinian), Galen Riordan (I Resurection I), and Cody Dunston-Jones (chromewarriorXIII) managed to get this delicious confection through the incredibly packed halls of New York Comic Con in one piece, but I'm guessing it involved some kind of technology from Aperture Science. It was an extremely kind and fantastic thing to do, and all of us who attended Comic Con wanted to say thank you. You guys rock most mightily. Let this be a lesson to you all. If you want to be featured in a news story on The Escapist, you should bring us food. Yeah, we're easy like that.